LucyLures incorporate a hook-set comprising one or hooks that can be ‘dressed’ with a hook-less lure body. 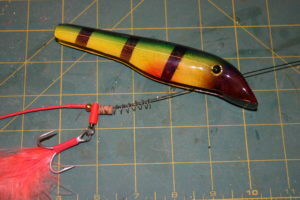 The hard bodied lure bodies prevent the fish from biting down on the hook(s), allowing the hooks to move as increasing tension in the line overcomes the biasing action of the spring. When a fish takes a firm grip on the lure and turns away, the increasing tension in the line will compress the spring and pull the hook(s) towards the front of the lure hooking the fish in the process. ‘Twist-off’ is reduced by the separable nature of the hook-set and lure body and because of the many degrees of freedom in the hook mounts (the hooks are attached to the titanium trace via swivels). The design is such that the front hook will ride ‘point down’ so that it is effective for hooking fish. The rear hook (if fitted) will tend to ride ‘point up’. To dress the hook-set with a LucyLures body, the loop in the free end of the titanium hook-set is threaded through the hole in the lip of the lure and the hook-set is clipped behind the stiff bristles set into the channel in the underside of the lure to retain the hook-set in place. The free end of the titanium wire trace is then attached to a conventional wire trace employed as an up-trace. 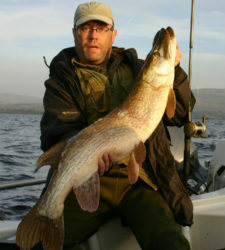 LucyLures are very effective and friendly to both fish and fishermen. LucyLures mean that fewer hook points per inch are required for effective hook ups. The separable nature of the hook-set and lure body and the fact that the hook-set has many degrees of freedom makes it very difficult for a fish to twist-off. 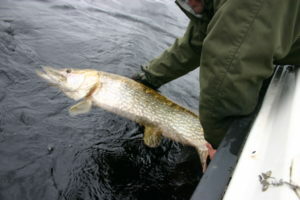 The separable nature of the hook-set and lure and the fact that the hooks themselves are not a fixed distance apart makes it easy to unhook fish and release them unharmed. The hook-less lure bodies can be stored without the danger of getting tangled and may also be safely kept in your pocket. An in-line rattle may be threaded onto the hook-set before the lure body is mounted and because there is no trailing hook on the lure body, various attractors can be fitted to the rear of the lure body without interfering with the hooks. Because the LucyLures bodies are not load bearing when a fish is being fought, lures can be made out of much lighter material. This also means that ‘stick baits’ can now be used safely for pelagic species e.g. Marlin. 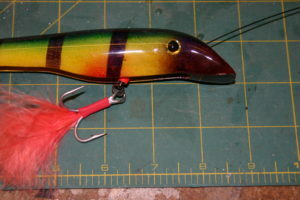 A LucyLures six inch yellow Perch pattern ‘Victor’ accounted for this Pike. 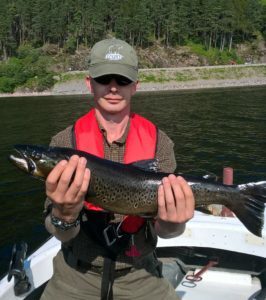 Ferox – caught by the guys at Fish Loch Ness.